It’s the last day of January, and already the year is rolling along. So far, knock on wood, I’m keeping up. I hope you are, too. Without further ado, its time for this month’s book. If you noticed the missing apostrophe in the previous sentence, January’s book should appeal to you. It’s The Great Typo Hunt: Two Friends Changing the World, One Correction at a Time. Distressed by our country’s public displays of poor punctuation and other grammatical goofs, Jeff Deck, an editor “with no off-switch,” formed the Typo Eradication Advancement League (TEAL) with his friend Benjamin D. Herson. The goal of these two brave souls was to locate—and correct—such mistakes. Like any noble quest, it required hitting the road. Armed with sharp eyes and a Typo Correction Kit (correction fluid, chalk, markers), the friends “circumnavigated America, righting the glaring errors displayed in grocery stores, museums, malls, restaurants, mini-golf courses, beaches, and even a national park.” That’s right—not only did they find mistakes, they fixed them whenever they could. In some cases, the correction could be accomplished with a surreptitious swipe of a Sharpie. But many times, it required pointing out the error to an actual human being. The responses Jeff et al. received ranged from gratitude to complete slacker indifference to a lawsuit over the defacement of federal property. My hat is off to the members of TEAL for having the courage to take a stand against typos. The day we stop caring about proper grammar and punctuation is the day we decide it’s okay to throw gum on the sidewalk or step on another person’s foot without apologizing. Oh, wait. Maybe we’re already there. Do you notice mistakes? Have you ever asked to have one corrected? The "great typo hunt" could be the subtitle of all my manuscripts. But my biggest goof lately was revising the wrong version of a short story manuscript. Ah, fortunately or unfortunately, I too have an editor in my head, one whose switch is never off. I've gently tried to call attention to "avacado", "potatoe", "tomatoe" and "spinash" in restaurants, and usually get a blank look. But I keep trying. We were in Tucson last week and went to a lovely restaurant, and though I can't remember now, this lovely menu had two misspellings. I did point them out to the wait person. He seemed mildly interested. 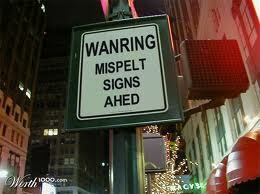 Generally, one can't GET to the person who gives a s**t about the spelling. My other crusade is to stop sandwich shops from using the word "paninis" for sandwiches and "panini" for one sandwich. Panino is the Italian word for sandwich (or one of them, anyway); thus panini is the plural. One panino, two panini. Mad Greens actually did act like they cared, but Fiona's didn't give a whit. Kay, I've had similar mix-ups...it says something about my organizational skills, I suppose. W. d'I, you should be an honorary member of TEAL. And now I'll think of you every time I see the word 'paninis'! The mistakes in signs and scrolling news on television and newspaper articles drive me nuts. I should start collecting them for occasional blog posts. Great post about TEAL--my copy editor heart/red pen cheers them on! Please could you put a period at end of abbreviaton al in et al.? (... Jeff et al. received ....) Thanks! Oops, and I had my own typo!! Meant abbreviation!! Pat, considering your editorial skills, I'm sure you could have quite a collection in no time. They say there is no such thing as a perfect document. So I look at typos as easter eggs when I'm reading. Some stories are littered. Brooke, thanks for sharing your memorable typo. I hope the clients had a sense of humor about it.